It was on my 20th birthday in 1975 that my father unexpectedly asked me what I wanted to do with him for the day. “I’m yours”, he said with a big grin. This was highly irregular for my father, whom I shared with my four brothers, to make himself available exclusively to any of us for a whole day. “Wow!” I said eagerly, “anything?” My heart was pounding. I instantly knew there was only one answer, a canoe trip to the big Hay Point. Hay Point was an enormous, mysterious and wild place I had only known through my father’s stories. It was more than a thousand acres of marshland on the southwest shores of St. Joseph Island in Lake Huron, not far from old Fort St. Joe. You can’t drive there and its really too far and rugged for a walk. Mom’s and Dad’s romantic stories of an earlier time always struck a chord with me since they had moved us to nearby Sault Ste Marie when I was just a toddler. They knew a different world. My childhood saw the country-side on the family’s weekend nature walks, spotting lady-slippers and picking morels. The canoe was a recent addition to the family. Today would be a double treat, a canoe adventure and to set foot on the great untouched wild marshlands I had never seen. Dad’s invitation was particularly unexpected since I was back home for the summer from university and he was rather unsure about the whole idea of advanced education. I was the first in my extended family to go to university and Dad had preferred that I follow in his footsteps and learn a trade. That was something he knew about. It was Mom who encouraged me to go for the education. It was a kind of leap of blind faith on her part that maybe something magically would happen and I would either become some kind of professional or just find the meaning in life that I was so desperately seeking. But on this happy birthday I took the bait and didn’t give Dad a chance to change his mind. We packed a lunch, threw the canoe in the back of the pickup and headed off for Hay Point. The family had also gone there to harvest the marsh hay when the farm’s hay fields were so dry they wouldn’t produce any hay worth cutting. On the farm the livestock had to eat, so Dad and Uncle Roy took the team of horses with the hay mower along the miles of shore line to the marsh. The grass was tall, over their heads in fact, and even though it was a tough grass for the livestock, it was better than none at all. 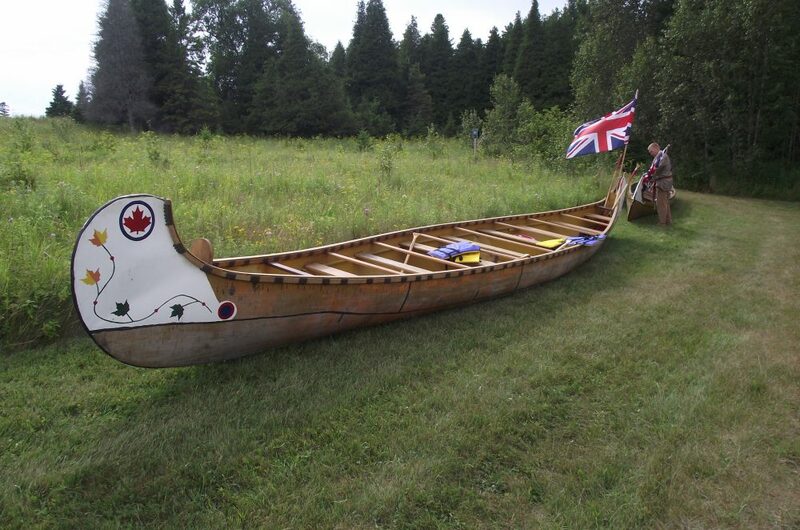 Dad also told us about the time he and Roy decided to take a canoe to join a group of locals at Old Fort St. Joe for a Dominion Day (July 1st) celebration. 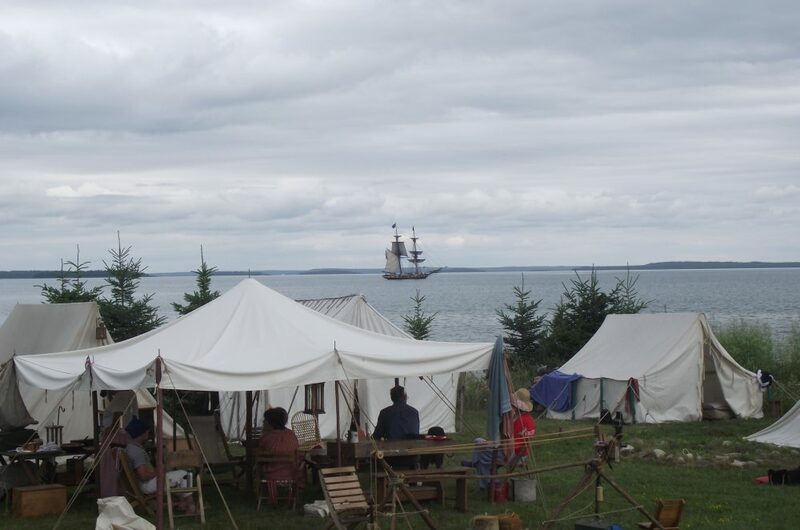 Fort St. Joseph was the most westerly British fort during the War of 1812. It was eventually burnt to the ground, but as a young man, Dad was active in promoting the stabilization and preservation of the historic site. When Dad and Roy got out on the lake the swells began to rise four feet, five feet, and then six feet high! People gathered on the shore and watched with baited breathe as the two in the canoe appeared and disappeared from sight with each heave and dip of the white caps. They wondered where the canoe would come up next, or if it would come up at all! We were lucky this morning of my 20th birthday. The August sky was clear and bright, the water calm and warm. Here I was in the bow of the canoe with Dad in the stern. I was a novice but Dad was an old hand on the water. His father had been a commercial fisherman on the Great Lakes until the Smelts (fresh water Herring) invaded in the Depression years and ruined the commercial fishery. Dad knew everything about the water. We easily paddled with a gentle breeze on our backs from the launch at end of the “A” Line to the north end of Hay Point. We shared the channel of the St. Mary’s River with great ships from as far away as China and Russia, though we stayed closer to shore and the freighters stayed close to the centre of the channel in the deepest water. I could see the long shore of the marsh off in the distance but it was quite a while before we got close. As we approached Hay Point, we manoeuvred the canoe up a small quiet stream that turned into a beaver canal. When we were able to step ashore I found myself surrounded by the tall Grass that lined the banks. This being mid-summer, there were no migrating geese to be heard, but there were Mallard Ducks, Red-Winged Blackbirds and other marshlanders calling near and far. From an old mound of grass I was able to glimpse the vast territory of pristine wilds. I could imagine those thousands of honking geese, and maybe a nearby browsing moose. This was the story land world of my father’s youth! My eyes and my imagination were filled with the vast wildness of the wetland space. When it was time to go, we turned the canoe back to the lake. It didn’t take long before we realised the waters had changed. It wasn’t the wind, but the rising swells. I was again in the bow as the waves crashed against the front corner and soaked me. The water splashed high in the air catching sunshine and sparkling! The canoe dipped and tossed in, at first, three foot swells, then four. It was the most exhilarating roller coaster ride I could imagine! I felt perfectly safe, though, despite the depth of water beneath us and the fact that I couldn’t swim very well. The life preserver and Dad were all I needed. I paddled hard while Dad both paddled and steered straight into the waves. If he had not kept us square to the waves we probably would have been swamped! Crash, came the waves. Crash, and crash again! Each crash quickly vaulted the bow high and then dropped us back down into the trough where we crashed again. The spray over the bow was wet and warm and I laughed from the bottom of my stomach. Dad, normally a fairly quiet stoic man, was grinning ear to ear and had to let out a few hearty laughs now and again. I imagined, had there been some people on shore, if maybe they would wonder where we would reappear after each dip, or if at all. It was, I would later learn in psychology class, a peak experience. I was totally engulfed in the moment of ecstasy, one with my Dad, one with nature, one with myself. 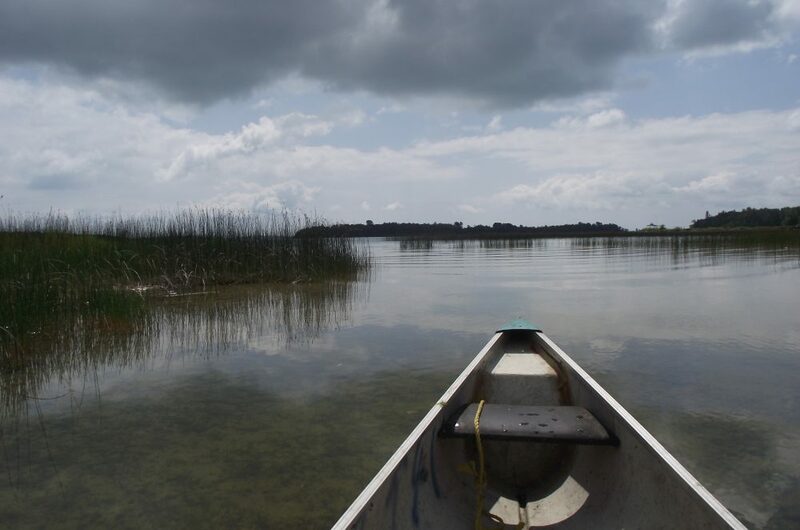 When we got back to the “A” Line, and heaved the canoe back into the pickup, I knew that I might never again feel such total joy to the core of my soul. And I remember this special day now that my Dad, Russell Adcock, is gone. He and this memory will always be with me. He educated me on the important lessons of life, on history, in nature, first hand. The last time I saw him, I knew it would be my last. That was in late February 2007. I was visiting from far away Edmonton, Alberta. My brother Grant drove me and our Mom to visit Dad at the extended care facility in Sault Ste Marie. Dad was then living with a form of terminal Parkinson’s disease with advanced dementia. As we turned the the final corner for the last stretch of road, I braced myself, and then this song came on the radio – In The Living Years, by Mike and the Mechanics! I was in deep trouble. Of all the songs in the world to be playing at this precise moment! It could not possibly be just chance. It was a sign, a signal to prepare! The song ended at the exact moment Grant pulled into the parking stall at the facility. It was a long moment before I was ready to go in, knowing it would be my last visit. But we went in for that painful final visit. As I was leaving, and there was no one left in the room but me and Dad, I leaned over, choked up, hugged him and told him, “I love you, Dad“. My Dad, Russell Adcock, died April 22, 2007. He sails now to his heart’s content.